Very musical with great image and separation in two channel driving KEF Reference Model 2's with a Martin Logan Grotto 1 sub and signal from Sony CAS70ES CD player using fiber connection and Denon DAC's. THX and DTS add KEF Monitor SP3253 and Reference Model 100 center channel speaker (all of the speakers use Uni-Q drivers), Sony BDP-BX58 BlueRay player using fiber connection and Denon DAC's. For general background music I use the 5 channel stereo mode. 3 years ago I needed to have the output resistor boards replaced after 15,000 hours of use; which really isn't too bad considering the hundreds of hours played rather loud, enough to warm up the heat sinks and turn the fan on. The THX and DTS does not image quite as well as new high end equipment, but I usually only watch 3 or 4 movies per month and I value the quality of sound when playing music. After wandering around reading reviews vs. the value I receive from this receiver, I see no reason to upgrade until this one dies completely or is no longer cost effective to repair - and I might just purchase another used one. Killer receiver. Great in all ways. Sounds like you have a powerful amp connected separately. Best Reciever i've ever heard. Period. It does way more than anything I have ever had. Was trying to replace ancient but nice Yamaha RX-V850 that blows power supply every 2-3 years. Found none except I wish the tone outputs were good old knobs. I am currently looking for a low-mid level receiver for second system 5.1 in living room. So overwhelmed by too many products so found this site to help me along. I input th Denon AVR 5700 since it's been great & am quite pleased with my purchase. I get comments of what a great unit it is but never really knew what I found. Seems like $ 150 was a complete steal? Happened along it by chance & stopped @ garage sale where entire system was $ 500. Should have bought everything. Have had no service issues with Denon. Very clean sound and voices during movies at higher power levels. Lots of inputs and connections. THX mode disappointing dynamically.Not as loud as the other modes.Had to set center speaker to max +12 db. Great location but generally powered subs lack punch and edge for this power user. 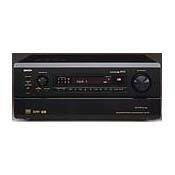 I bought this receiver without a remote on eBay for 500.00. After shipping and taxes plus buying a new remote the total cost was about 700.00.I am generally pleased with it at this price however I feel the THX mode sounds flat at higher volumes compared to the Yamaha RX-V795 I was using before.I have a 1989 Mitsubishi M AV2 external Receiver that I use to power a second pair 3 way speakers. It puts out phenominal amounts of power for its conservative 200 watt RMS rating.It can even power 2 sets of front speakers at full volume without clipping or crashing. They just don't make stuff like this anymore. My dual long throw JBL powered (250 watt times 2) subwoofers cranked harder with the Yamaha, having to be turned down from 0 to between -5 to -12 db.With the Denon I've got the subs set at max +12 db and still don't get the house shaking I had before especially playing movies like Die Hard or True Lies.I find the sound more dynamic in Pro Logic mode.I just bought a used Yamaha RX-V995 on eBay for 361.00 shipped to replace the 795 I put in the bedroom.I like the 5 channel stereo mode but am seriously thinking of putting the Denon in the bedroom and putting the Yamaha in the livingroom.The preamp outs put out a stronger signal on the Yamaha than the Denon. The volume control on the Denon can't be cranked up to a 1% distortion level which would definately give it the punch I can get out of the Yamaha. Lots of power. Very dynamic but smooth sound. Remote programs like a Pronto. Fan is silent, receiver runs cool. THX Ultra. Remote is a little cluttered. Great sounding receiver. With current used prices, this reciver is a bargin. If you only need 5.1, this thing beats almost all the newer models out there. I bought this unit thinking it would be a genuine upgrade from my 992. I still had my 992 when i received the 5700 so I decided to compare them. I was shocked to find that the 992 outperformed the 5700 in almost every aspect. The 992 was so smooth in stereo compared to a harshness in the treble on the 5700. In dolby digital the 5700's diologue sounded very unnatural and grainy. The 5700 may have outperformed the 992 a touch in the bottom end bass but that's it.The soundstage of the 992 was so much larger than the Denon and more enveloping. I don't know if the unit I had was defective or something but I returned it and decided to shop around some more. 1. Can´t shut of the display via the remote. 2. OSD looks rather boring. 3. Remote is big and cluttered with buttons, only a few of them glow in the dark. Stellar performance in every way ! Finally an amplifier that I feel 100% happy with, and will probably keep forever thanks to its ability to upgrade.